Considering that sprouts contain concentrated nutrients and vitamins in a small, easy-to-eat form, it’s no wonder that they are popular in salad bars and fresh produce markets. In addition, they pack a wallop of flavor and some nutrition experts recommend them as part of a healthy diet. You can easily grow your own seed sprouts in a jar at home . Choose your favorite seeds for sprouting. 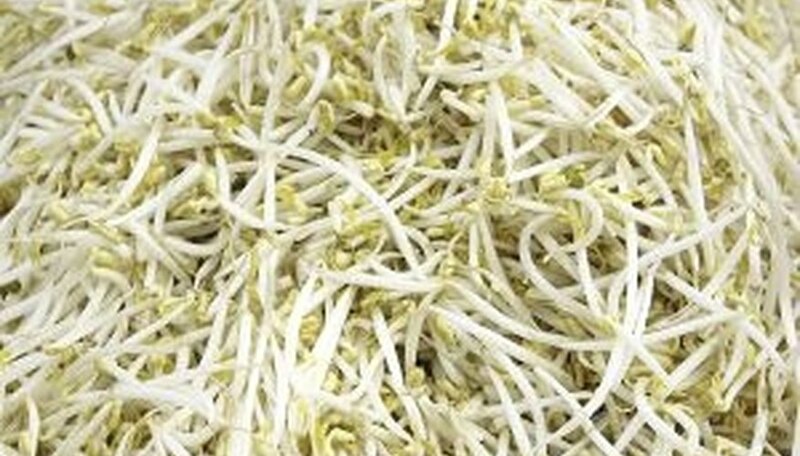 Mung bean sprouts are common in Chinese dishes and in recent years, radish, alfalfa, lentil, broccoli and soybean sprouts have enjoyed popularity in salads, sandwiches and soups. Try sprouting a variety for the best taste combination. Purchase seeds in bulk from health food stores. Wet the seeds thoroughly in warm water and strain through a fine sieve. Gently stir the seeds and remove any small pebbles or other foreign objects. Place clean drained seeds in a glass jar and pour in approximately three times as much water as there are seeds. Cover the top of the jar with cheesecloth or fine nylon mesh and use a large rubber band around the top to fasten it securely. You can use a piece of clean pantyhose, if desired. Soak the seeds for a couple of hours and then drain by tipping the jar upside down and allowing the water to drain out through the mesh. There is no need to remove the mesh. Place the jar of drained seeds in a warm dark place. The best temperature to spout most seeds is between 70 and 75 degrees. If the area is cooler, they may take longer to sprout and if it’s warmer, the seeds stand a chance of developing mold. Position the jar upside down on an angle to allow extra water to drain out. Put a saucer or plate underneath to catch any drips. Rinse the seeds three or four times a day by putting fresh water into the jar, without removing the cheesecloth and draining. Replace the jar at an angle and return to the dark place. Move the jar into the sunlight on the third or fourth day when sprouts appear to encourage the formation of green leaves. Continue to rinse the sprouts and drain them at least twice a day. Remove the finished sprouts from the jar and rinse away hulls and drain in a colander before storing in clean plastic bags in the refrigerator. Use the sprouts within three or four days.